9+ months† <br />†The age is provided for guidance only <br /> <br />Parent's Choice Little Hearts are a great way to introduce your child to new tastes and textures. <br />Your child may be ready to use this product if she or he: <br />• Crawls with stomach off the floor <br />• Begins to self-feed with fingers <br />• Begins to use jaw to mash food <br /> <br />Watch your little one snack with delight on delicious Parent's Choice Strawberry Yogurt Little Hearts Puffed Grain Snack, Stage 3, 9+ Months. Made with whole grains and wholesome strawberry yogurt, these yummy puffed morsels make for an enjoyable bite to eat. Your child may be ready to consume this snack if they are able to crawl with their stomach off of the floor, are beginning to self-feed with their fingers, and are beginning to use their jaw to mash food. Perfect for on-the-go eating, this 1.48-ounce plastic container features a resealable pop-top. For a great introduction to new tastes and textures, give the naturally flavored Parent's Choice Strawberry Yogurt Little Hearts Puffed Grain Snack, Stage 3, 9+ Months to your little one. <br /> <br />Parent's Choice provides parents with baby and toddler products you need at a price that won't push your budget over the edge. We offer everything you need from bath time to bed time and every time in between, all with the high quality we know your little one needs. Parent's Choice is conveniently available online and in Walmart stores nationwide, allowing you to stock up, save money and live better. Parent's Choice Little Hearts are a great way to introduce your child to new tastes and textures. Watch your little one snack with delight on delicious Parent's Choice Strawberry Yogurt Little Hearts Puffed Grain Snack, Stage 3, 9+ Months. Made with whole grains and wholesome strawberry yogurt, these yummy puffed morsels make for an enjoyable bite to eat. Your child may be ready to consume this snack if they are able to crawl with their stomach off of the floor, are beginning to self-feed with their fingers, and are beginning to use their jaw to mash food. Perfect for on-the-go eating, this 1.48-ounce plastic container features a resealable pop-top. For a great introduction to new tastes and textures, give the naturally flavored Parent's Choice Strawberry Yogurt Little Hearts Puffed Grain Snack, Stage 3, 9+ Months to your little one. Parent's Choice provides parents with baby and toddler products you need at a price that won't push your budget over the edge. We offer everything you need from bath time to bed time and every time in between, all with the high quality we know your little one needs. Parent's Choice is conveniently available online and in Walmart stores nationwide, allowing you to stock up, save money and live better. 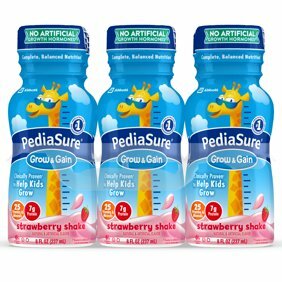 This product should only be given to children who are familiar with eating solid foods. Children should be seated and supervised while eating. Package not intended as a toy. Nothing. I've bought them before and was pleased with the product. My daughter loves eating puffs! They teach her many learning skills. They taught her how to pick up each item and put them in her mouth!! Love these! I don't know if they are old, or b/c of the yogurt in them, but they taste stale. My child won't eat them. My 10 month old daughter ended up with hives after eating this product. She never had a reaction to anything before but something in these puffs caused a reaction. Will not be buying this product again!